Anthony: Nothing and no-one inspired me more to dance than my parents, or my dance teachers Joe Stanford and Michael Sullivan. My teachers inspired me when I was younger by sharing the message that I could leave the planet better than I found it without even using words. This is what continues to inspire me. Dance Mogul: What was it about tap dance that made you pursue it? 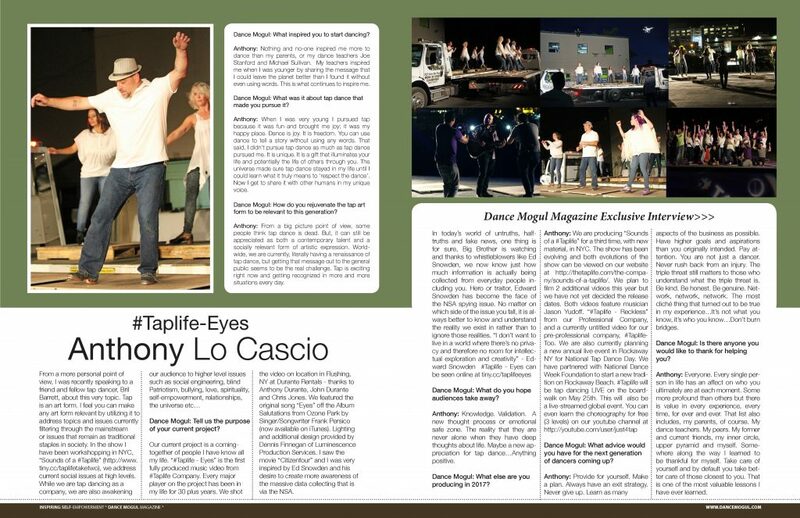 Anthony: When I was very young I pursued tap because it was fun and brought me joy; it was my happy place. Dance is joy. It is freedom. You can use dance to tell a story without using any words. That said, I didn’t pursue tap dance as much as tap dance pursued me. It is unique. It is a gift that illuminates your life and potentially the life of others through you. The universe made sure tap dance stayed in my life until I could learn what it truly means to ‘respect the dance’. Now I get to share it with other humans in my unique voice. Dance Mogul: How do you rejuvenate the tap art form to be relevant to this generation? Anthony: From a big picture point of view, some people think tap dance is dead. But, it can still be appreciated as both a contemporary talent and a socially relevant form of artistic expression. World-wide, we are currently, literally having a renaissance of tap dance, but getting that message out to the general public seems to be the real challenge. Tap is exciting right now and getting recognized in more and more situations every day. Dance Mogul: Tell the purpose of your current project? Anthony: Our current project is a coming-together of people I have know all my life. “#Taplife – Eyes” is the first fully produced music video from #Taplife Company. Every major player on the project has been in my life for 30 plus years. We shot the video on location in Flushing, NY at Durante Rentals – thanks to Anthony Durante, John Durante and Chris Jones. We featured the original song “Eyes” off the Album Salutations from Ozone Park by Singer/Songwriter Frank Persico (now available on iTunes). Lighting and additional design provided by Dennis Finnegan of Luminescence Production Services. Dance Mogul: What do you hope audiences take away from ? Anthony: Knowledge. Validation. A new thought process or emotional safe zone. The reality that they are never alone when they have deep thoughts about life. Maybe a new appreciation for tap dance…Anything positive. Dance Mogul: What else are you producing in 2017? Anthony: We are producing “Sounds of a #Taplife” for a third time, with new material, in NYC. The show has been evolving and both evolutions of the show can be viewed on our website at http://thetaplife.com/the-company/sounds-of-a-taplife/. We plan to film 2 additional videos this year but we have not yet decided the release dates. Both videos feature musician Jason Yudoff. “#Taplife – Reckless” from our Professional Company, and a currently untitled video for our pre-professional company, #TaplifeToo. Dance Mogul: What advice would you have for the next generation of dancers coming up? Anthony: Provide for yourself. Make a plan. Always have an exit strategy. Never give up. Learn as many aspects of the business as possible. Have higher goals and aspirations than you originally intended. Pay attention. You are not just a dancer. Never rush back from an injury. The triple threat still matters to those who understand what the triple threat is. Be kind. Be honest. Be genuine. Network, network, network. The most cliché thing that turned out to be true in my experience…It’s not what you know, it’s who you know…Don’t burn bridges. Anthony: Everyone. Every single person in life has an affect on who you ultimately are at each moment. Some more profound than others but there is value in every experience, every time, for ever and ever. That list also includes, my parents, of course. My dance teachers. My peers. My former and current friends, my inner circle, upper pyramid and myself. Somewhere along the way I learned to be thankful for myself. Take care of yourself and by default you take better care of those closest to you. That is one of the most valuable lessons I have ever learned.